• When a mother is going to be away from the baby for some time. • When a baby is prematurely born and is unable to take milk directly from the breasts for the first few days. • If the mother starts going to office for long hours. 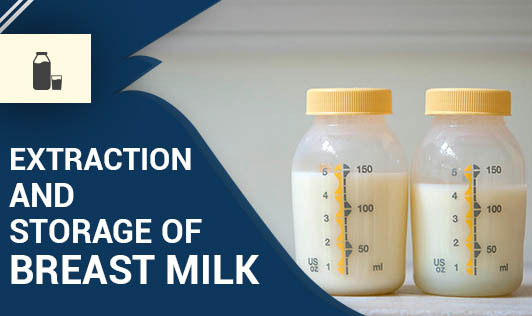 Breast milk can be extracted by massaging the breast in a particular manner or by manual pumps which are available in the market. Freshly expressed breast milk can be safely stored in the refrigerator using plastic bottles or bags with a seal. It can be stored in the fridge for up to 5 days at a temperature of 4 Degree Celsius or lower. It can also be stored in the freezer for 10 to 15 days. In this case, it needs to be thawed properly before feeding it to the baby. It can be thawed by keeping the bottle or the bag in warm water or hold under running tap water. Do not re-freeze the breast milk and make sure the left over milk is not used again.